What makes us want to explore the Great Beyond? It's not that we really wanted soil samples. As First Man brings to life in a vivid way, getting to the moon was a highly dangerous, incredibly expensive, wildly ambitious effort with no guarantee of success and a huge risk of costly failure. The real heft of it, we think, lies in something else. It's something that can be revealing about human nature. Because explaining why we do one thing means explaining why we do anything. It's similar, for example, to talking about why someone chooses to climb Everest. Why, after all, does anybody do anything? "It's because they're stupid, that's why. That's why everybody does everything." To really explain this, we need a model of human nature. And modern thought doesn't really offer us much of one. Which means we'll just have to answer this one ourselves. Let's explore this. As a serious inquiry. What's the answer? Let's look first in the obvious place: at what the man who really set it in motion, John F. Kennedy, in a scene that made a brief appearance in the movie. This, of course, is an inspiring, uplifting, timeless answer. But intellectually, it leaves you hungry. And to be fair, it's not meant to be an informative, intellectual answer. It's a political speech that's meant to rouse a crowd emotionally. It's meant to move people, not inform them. And clearly, it did the job. But that's not what we're after, right here, now. We want an answer that satisfies us. After all, there are plenty of things that are hard. We could try to invent ice cream that doesn't make us fat. We could try to make puppies that never grow into dogs. You can try to bring about world peace. Plenty of things are hard. Why go to the moon? 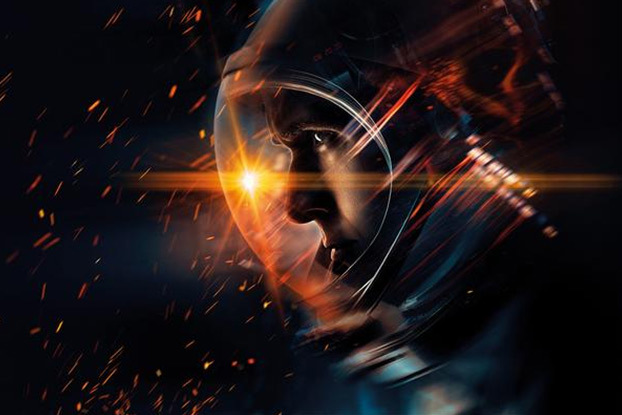 Let's dig into something that's not a political speech, but a few words by a team of talented creatives, struggling to articulate the essence of the idea into just a few words, as they did for the movie First Man. "I had a few opportunities in the X-15 to observe the atmosphere. It was so thin. Such a small part of the earth. You could barely see it at all. And when you’re down here in the crowd, and you look up, it looks pretty big, and you don’t think about it too much. But when you get a different vantage point, it changes your perspective. I don’t know what space exploration will uncover, but I don’t think it’ll be exploration for the sake of exploration. I think it’ll be more the fact that it allows us to see things that maybe we should’ve seen a long time ago. But just haven’t been able to until now." This answer is much more satisfying. "...it allows us to see things that maybe we should've seen a long time ago." The movie leaves it there, understandably. But it also leaves questions. After all: what are those "things"? Whatever they are, should we really have been able to see them a long time ago? Would we have even been able to? Now that we've gone to the moon, have we seen them? Of course, this isn't really fair. Again, in the passage above, Armstrong is, in a sense, being poetic. He's trying to put into words something we all feel. Slicing and dicing it up, scientifically and rationally, somehow serves to empty it. It misses the point. So then, what is the point? Why did we go? There's a spiritual component of human nature. This component gets "drawn out" by certain people and events and things. One things that has almost always drawn this out in almost all of us is "The Great Beyond" of outer space. There seems to be something along the lines of a "Great Beyond Within" each of us. And we project that - whatever it is - onto other people and things like mountains (such as Everest) and the moon. It's an act of projection: we take something inside ourselves, project it onto things outside of ourselves, and then explore it, in a sense, as a way of exploring ourselves. We sense that there is a "task most urgent." In moment of wonder and awe, we can sometimes sense that there are vast mysteries to explore. We crave to explore them. It's so powerful that we willingly give our lives to pursue them. As many astronauts did. This sense of wonder and awe and vast potential within us is something that can be triggered and activated by any number of things in our environment. And then, we project that onto the world "out there." And then we explore it - because that task seems immeasurably worthwhile. But the source of that awe is within us. And we can explore it there, too. So, that's our humble little hypothesis about why we went to the moon. Talk about it in the LiveReal Discussion Board. Is There a Spiritual Component to Human Nature?